It’s hardly an anniversary many will register, but last week marked 30 years since President Jimmy Carter authorised the first covert CIA operations against the government of Afghanistan. By backing the anti-Communist mujahideen and creating civil unrest, the plan was to provoke a Soviet invasion and thus, in the words of Carter’s adviser Zbigniew Brzezinski, “[give] the Soviet Union its Vietnam War”. History records this Cold War gamble paid off. But the laws of unintended consequences have also meant that 30 years on we’re still living with its legacy. The “warlords” who inherited the ruins of Afghanistan after the Soviet army began pulling out 10 years later in turn provoked the reactionary extremism of the Taliban. The ensuing fundamentalist Islamic state became a refuge for bin Laden and al Qaeda . September 11 provoked another invasion, this time by the US and its western allies. Seven years on we are hearing the familiar comparisons with Vietnam all over again. Overall, civilian deaths are at their highest since the start of the war and military casualties, while not as bad as in Iraq in terms of sheer numbers, are rising. Pakistan now harbours something like 1.5 million Afghan refugees. The opium trade is back in business. The Afghan army remains inept and untrained. Iraq has drained American and Nato military resources. (CNN) — For the second month in a row, U.S. and allied troop deaths in the Afghan war have surpassed those in Iraq, according to official figures tallied by CNN. In June, 46 foreign troops died in Afghanistan and 31 troops died in Iraq. In May, 23 foreign troops died in Afghanistan and 21 died in Iraq. A Pentagon report issued last week about Afghanistan said that security in many areas of the country is regarded as “fragile” and that Taliban militants have regrouped into a “resilient insurgency” after the Taliban was toppled from power in 2001. June was the deadliest month for foreign troops in Afghanistan since the conflict there began in 2001. 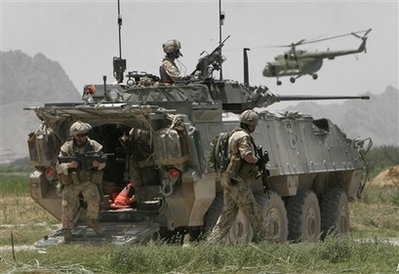 Twenty-eight Americans, 13 Britons, two Canadians, one Pole, one Romanian and one Hungarian died in Afghanistan. The latest deaths were three American troops who died in a vehicle rollover while on patrol in Kandahar province. KABUL, Afghanistan (CNN) — Afghan President Hamid Karzai has ordered an inquiry into allegations that 15 civilians were killed in a U.S. military strike targeting militants. The number of civilians killed in Afghanistan has risen by almost two-thirds in the first half of the year compared with 2007, UN figures showed today. 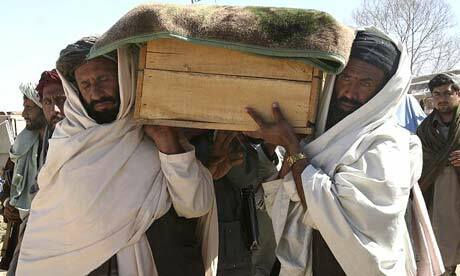 The figures, which reveal that almost 700 civilians have died, show that the instability and violence afflicting the country are taking an increasing toll on ordinary Afghans. John Holmes, the UN’s humanitarian affairs chief, said a recent increase in militant attacks was making it increasingly difficult to deliver emergency aid. “The humanitarian situation is clearly affected and made worse by the ongoing conflict in different parts of the country,” he said in Kabul. The hearts and minds of those we are trying to save, die from the good intentions the Bush Message sends every day. WASHINGTON (CBS News) ― Grappling with a record death toll in an overshadowed war, President Bush promised Wednesday to send more U.S. troops into Afghanistan by year’s end. He conceded that June was a “tough month” in the nearly 7-year-old war. In fact, it was the deadliest month for U.S. troops in Afghanistan since the conflict began. Mr. Bush said it was a tough month too for the Taliban fighters. The former ruling Islamic militants have rebounded with deadly force since their overthrow 6½ years ago by U.S.-led troops. “We’re going to increase troops by 2009,” Mr. Bush said, without offering details of exactly when or how many. The more Bush pledges, the more Bush promises, the more Messages Bush sends dig us deeper into the body count … The message the world has heard since 9/11 is that the USA has devolved into the evil empire. The seeds of resentment, hate and conflict have been sewed by the USA since WWI. That was when the US started picking up where British Imperialism left off. Using better euphamisms, the US has embedded its influence across the world with the similar manipulation techniques used by Britain. It is all about creating a monopoly for resources and commerce. Body count becomes incidental. Any promises Bush makes at this point is so moot it would be comical had Bozo the Clown not passed away recently. Bozo actually reincarnated before his passing.